Effortlessly backup your IT infrastructure. BackupAssist makes the core decisions easy: what to backup, where to backup and when to backup. Your systems and data are in safe hands. Rapidly retrieve the data you need. 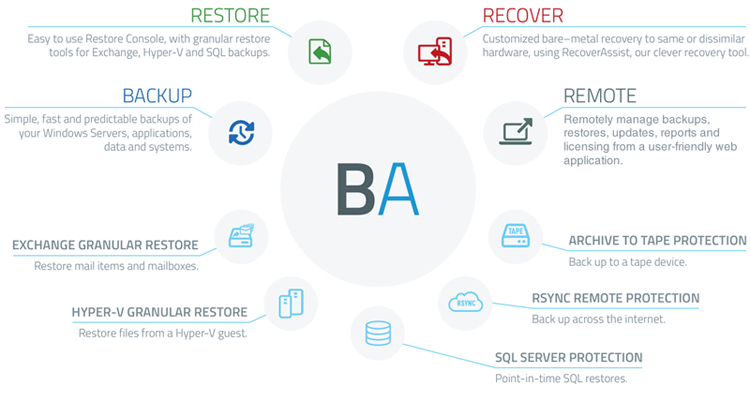 BackupAssist provides an integrated suite of restore technologies that step you through the restore process. Fast, easy, comprehensive restores. 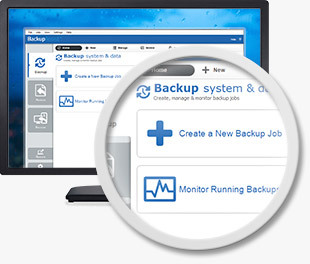 Quickly rebuild your entire system from a backup. When disaster strikes, you can minimize downtime by relying on BackupAssist to recover your data & systems fast. Save time and effort by managing backups, restores, reports, notifications and licensing across multiple machines from a central web application. Affordable – You only ever pay for what you need. Our flexible, modular pricing means you buy a base–license and purchase add-ons only as required. If you don’t need it, you won’t pay for it. Fast & Easy - Schedule and automate your backups for fast, painless data security. 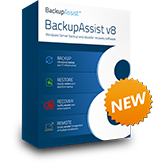 BackupAssist defines set and forget with advanced, customizable automatic backup schemes. Flexible - Backup to a comprehensive range of destinations. Define your own dynamic security and backup to network, NAS, RDX, iSCSI, local drives, optical drives, USB HDD, tape or cloud. +NEW - Superior imaging backups – Your backup history and storage space are now fully managed, giving you added control over how much history to keep. +NEW - Improved imaging backup reports – You can better manage storage capacity issues by actively monitoring your restore points, including a detailed breakdown of what your backup destination contains. +NEW - Advanced backup verification – Get feedback on potential restoration issues, plus added reassurance your application data is secure. V8 offers restore testing and built in validations for Image, File, Archival, Exchange and Hyper-V backups. +NEW - Optimized System Protection – Your server backups are faster and more precise than ever through utilization of our cutting-edge "fast incremental" technology. +NEW - Improved Hyper–V setup – It's even simpler to configure your Hyper–V backup options a number of cast improvements to the setup process for Hyper–V hosts. +NEW - Flexible custom schemes – You can tailor your backup schedule to your exact requirements with greater flexibility and precision added to custom scheme options. +NEW - Improved Exchange granular restore – You can open, search and restore mail items from PST and OST files with enhanced Exchanged account impersonation. +NEW - Increased Server 2012 R2 support – Your Server 2012 R2 benefits from improved support for backup, restore and recovery options of your data, systems and applications. +NEW - Enhanced installation process – You can perform administrative MSI installs without the hassle of interactive prompts. +NEW - Superior volume management – Your image backup history (including iSCSI backups) is more secure than ever with inbuilt warnings when servers are missing a crucial VSS hotfix needed for securing backup history. The backup features depend on the operating system. For a list of supported environments for each backup technology, please refer to the individual feature pages. Below is a list of operating systems and technologies supported by BackupAssist.